For this collection, Muñoz has painstakingly reviewed every page -- every panel -- making clarifications, adding invaluable insight to this provacative story. 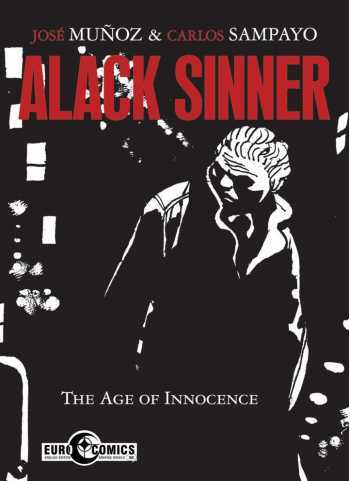 Sinner is a hard-boiled private detective whose adventures are played out to a jazz soundtrack in a noir New York from 1975 through the 2000s. The stories are imbued with a deep political conscience and present a scathing critique of corruption in society, juxtaposed with meditations on the nature of violence and exile. The authors have also rearranged the stories in chronological order of the characters and events, rather than dates of first publication, providing a novel reading experience for both new fans and old. The Age of Innocence collects eleven stories, including "Talkin' with Joe," "The Webster Case," "The Fillmore Case," "Viet Blues," "Life Ain't a Comic Book, Baby," "Twinkle, Twinkle," and "Dark City." Alack Sinner is an international bestseller and between them Muñoz and Sampayo are winners of Europe's top comics awards. Carlos Sampayo is an Argentine writer best known for his work in comics, particularly in collaboration with artist José Muñoz. The writer Carlos Sampayo is best known for the disturbing stories he made with artist José Muñoz. Sampayo met Muñoz in Spain after he fled from the military junta. They created 'Joe's Bar' (short stories about clients of a café in New York), 'Alack Sinner' (a hard-boiled detective in the style of film-noir), 'Jeu de Lumières', 'Billie Holiday' and other stories. Sampayo also worked with Oscar Zarate, Jorge Schiaffino and Solano López. Sampayo's work is unusually mature for the world of comics, because of its grimness. The expressionistic black and white drawing style of José Muñoz is the perfect form for these stories, which are not depressing because there's always some way out of the misery. Born in 1942 in Buenos Aires, Argentina, as a child José Muñoz manifested a great passion for design, and a particular interest in the world of comics. He emerged as an independent artist in 1963 with his detective series "Precinct 56". In 1974 he met the Argentine writer Carlos Sampayo and this fundamental event would mark the beginning of a long and fruitful collaboration. Thus the character of Alack Sinner was born - a private detective whose human adventures were played out to the sound of jazz, and described both the misery and nobility of a New York that was imagined in such a way as to almost have been real.